You think we made that last bit up. Read the Bible and get to the bit where Moses rides across the desert in triumph. I think they meant to say "on a Triumph" Either way, riding a motorbike is just part of growing up. Some things in life are necessary. Like food and water. Like the air we breath. And some things are not just necessary but compulsory. Like Compulsory Basic Training. If you want to ride a bike, we will tell you how to get more than food and water. We will tell you how to get the oxygen into your lungs and a licence into your wallet. Call us before it's too late. We can save lives or we can turn the one you already have into a time of joy and excitement. We are unique in Shropshire training companies in that we have our own premises with purpose built classrooms, toilets, a small kitchen, a microwave (warm up your soup on a cold winter lunchtime) a toaster (to dip your toast into your soup) a chocolate, crisps and drinks vending machine, and seven training sites. Of course, having all the proper facilities means that you aren't hanging about for half your life in the cold and damp, bursting at your seams with only a tree or lamp post to protect your modesty, and you aren't sharing a training area with parked cars or caravans and amenities which may, if you are lucky be the back of a van or a shed with no heat. We have access to a fleet of over thirty bikes and more fully qualified instructors that you could hide in your bedroom. But first, on your day, plan to arrive at about 8.45am, bring your drivers licence, your national insurance number (we need that to get you on our insurance) a sandwich and a smile and leave the rest to us. CBT will cost you from £135 and will never be on more than a two to one pupil/instructor ratio. You can be taught to ride on a 50cc scooter or a 650cc sports tourer - age dependent of course. 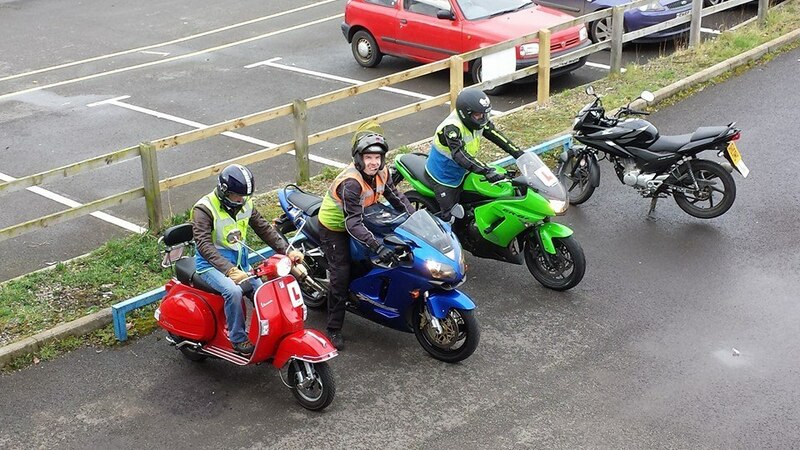 The CBT is arranged as a one day course and will take you to a level at which you would be safe to ride on your own. Dont worrry if you don't master the training in a day, some people don't but we offer additional training to get you through. One thing is certain, and that is you will be safe and very very happy.